Yesterday morning the milk cow was up and moving. By last night she was down, ears back, lethargic. We are in the midst of transporting our cattle to the butcher. The trailer is large enough for a few at a time so it takes more than one trip, and we were both off farm part of the day. Sybil is a Jersey cow, a breed that is naturally curious. So when she does not get right up, come right over to see us something is wrong. Actually, having her here for a couple of years she has always gotten up as we have approached her, except for yesterday. 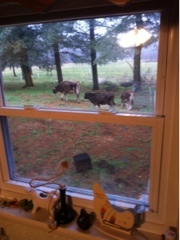 We called friends who keep a mix of livestock, and they arrived quickly. Armed with a variety of things they set to work with me asking questions "what are you doing now", "what are you looking for". We have instructions for follow up. If it is a blockage in her intestines the vet bill/surgery cost more than the cow is worth. If she has a cold...just like in humans, her mucus is milky, not clear, she just needs to be made comfortable and the cold will run its course. Our friends built a nest around her. She was cold and wet and not able to move, so they carried bales of hay (we are out if straw, so the good stuff had to be used) and broke them and stacked it all around and over her. The rain slowed down a bit. We could feel her warm up under the insulation of the hay. Instructions for follow up. A trip to Tractor Supply for things to help her along. Guarded optimism that Sybil will pull through. Thankful for folks with greater knowledge, a comfort to panicked farmers. And down cows. This is her with the calves, yesterday morning in the back yard.